Below you can view all the homes for sale in the Crystal Lakes subdivision located in Rock Hill South Carolina. Listings in Crystal Lakes are updated daily from data we receive from the Charlotte multiple listing service. 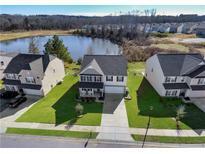 To learn more about any of these homes or to receive custom notifications when a new property is listed for sale in Crystal Lakes, give us a call at 704-325-4484. Professionally landscaped outdoor areas with a covered back patio and a large concrete terrace. MLS#3491474. Keller Williams Fort Mill. The huge owner's suite, office nook and loft are all features you'll enjoy in this beautiful home. MLS#3489944. Fathom Realty NC LLC. A must see, make it yours! MLS#3466810. EXP REALTY LLC.